With the holidays right around the corner, it’s a great time to avoid that dreaded “What will I get for everyone this year?” feeling. It’s also a time to stock up on unique hostess gifts that can be enjoyed throughout the season. And our definition of “spending time outdoors for the holidays” is not a visit to the local mall. We believe that the holidays should be enjoyed with friends and family, sharing great meals and good times. So, we’ve created >a host of holiday-inspired olive oils, gift sets and gift certificates, all available on-line at The Olive Oil Source Boutique. From The Olive Oil Source Thanksgiving Extra Virgin Olive Oil to our many Christmas and Hanukkah blends, you will find seasonally-inspired products with holiday labels to match. Our Figueroa Farms Holiday Blend Extra Virgin Olive Oil is a mild and fruity Italian blend of Leccino, Frantoio, Pendolino, Maurino and other Italian varietals. It pairs perfectly with the Figueroa Farms Holiday Balsamic Vinegarfrom Modena Italy. The Olive Oil Source Six-Pack Basket is a perfect way to introduce your friends to a host of flavored oils and vinegars that can spice up many dishes and spark inspiration in the kitchen. 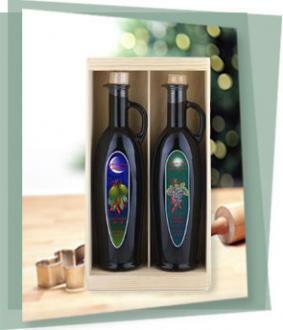 Or, create your own sampler set from our entire line of extra virgin olive oils and vinegars. For the culinary-challenged crowd, treat them to wonderful Marius Fabre olive oil soaps and lotions from France, or a gift set featuring the award-winning book, The Passionate Olive. So, visit us online and solve all your holiday gift-giving problems. And take advantage of free shipping for any order placed by December 6, 2010. It’s our small way to make your life a little easier during this hectic season.